The master tapes of this two CD set were lost for some period of time and recently re-discovered. 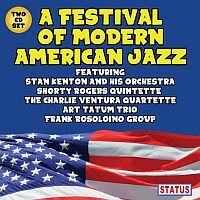 It features recordings of the Festival Of Modern American Jazz performed in Portland, Oregon on the 21st of September 1954. This concert was a coming together of some of the finest exponents of modern jazz including all the personnel of the Stan Kenton Orchestra which many enthusiasts believe was the best he ever led, guitarist Johnny Smith, Frank Rosolino, Charlie Ventura with Dave McKenna, Bob Carter and Sonny Igoe, Art Tatum with Slam Stewart and Everett Barksdale, and Shorty Rogers with Jimmy Giuffre, Shelley Manne, Pete Jolly and Curtis Counce. These wonderful recordings include all introductions and asides and as such represent an important historical document of the period when modern jazz was king.